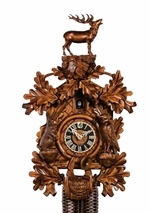 The first kind of cuckoo clock is the 1-day cuckoo clock. These clocks need to be wound up each day. You wind it up by pulling on the weights that hang from the bottom of the clock. The cuckoo bird calls the number of hours each hour and calls once on the half hour. Most cuckoo clocks come with shut off switches so you can turn them off at night. This is a great feature in case you don't want to hear the cuckoo at all hours of the night.